It's time to come clean on a some things. Time for Keeping It Real. 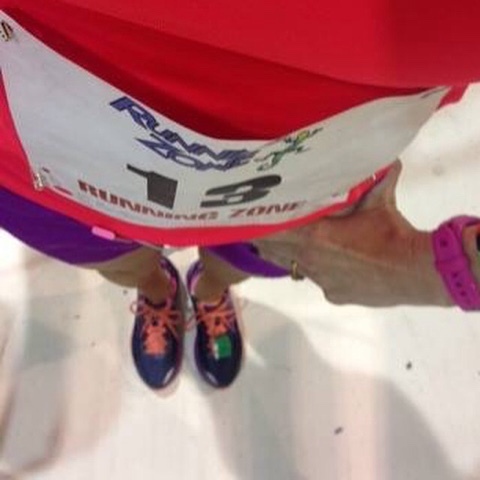 Time for a few more of my Runfessions! It's no secret that I'm a bit of a color freak. And, admittedly, I have a keen interest in fashion. But, I have three kids, two of which are in college (and one of them is graduating in a week!). I have a rather large house that is not 100% paid for (and is impossible to keep clean, by the way). The husband and I enjoy having a social life, and that doesn't happen without spending a few dollars on fun endeavors with friends. I also enjoy running, and we all know running does not come cheap. 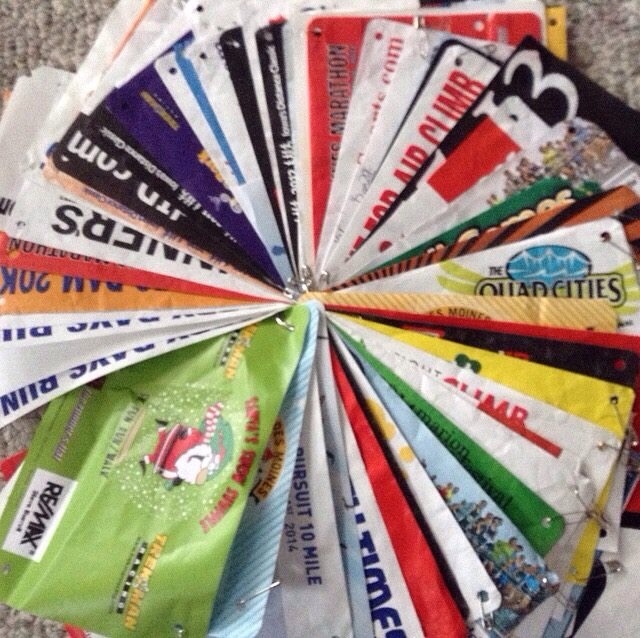 The biggest running expense for me is racing, particularly race registrations. 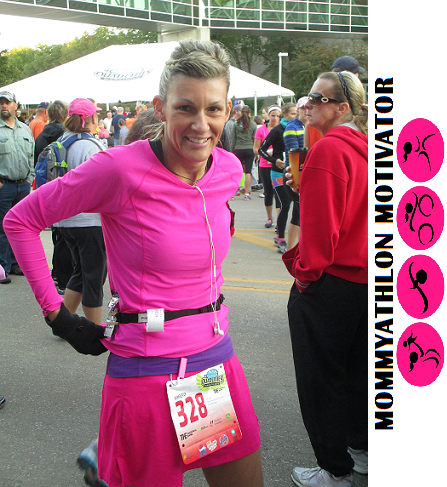 I've been doing half marathons since 2008, and in the past few years I have ventured into the marathon arena. I'm also embarking on my second Ultra in July.....and the bigger the distance, usually the bigger the registration fees (#ka #ching). 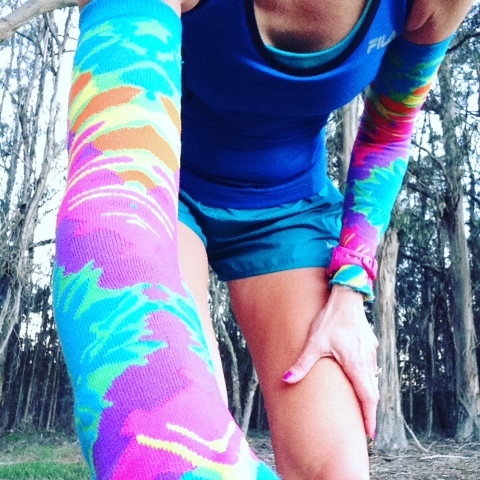 Arm Sleeves.... Have you seen or tried these little beauties? They have all the warmth off a long-sleeved top without the under-arm bulk. I wear them with tanks for most of my races because it's usually my arms that are cold at the start of a race (not my entire torso). They are easy to slide off (and tie around my waist) if I get too warm. And they are very colorful! I have some that were won (door prize), and a pair that I purchased at an expo. I think they cost $25-30, which may seem pricey, but I probably wear them at least a couple times a month. If you don't want to spend the money on arm sleeves, you can make your own from knee-high socks. For the Des Moines Half Marathon last October, I bought a double pack of socks at Walmart, for less than $5. My original plan was to cut off the feet and use them as "throwaway arm sleeves." Well, I liked the color and pattern so much, I still have them. They have been washed & worn several times since. Look closely....see the frayed edge of the sock on my wrist? 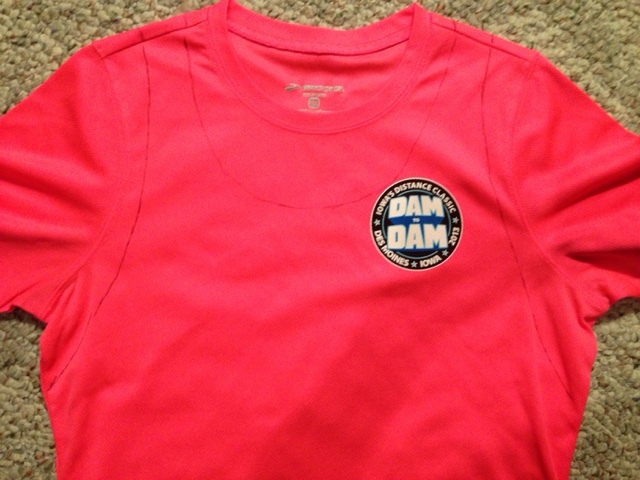 Modify and Get Crafty ...Do you love the graphics/color/theme of a favorite event, but not too crazy about the event shirt? I am a bit of a snob when it comes to fit. I don't want things sagging and bagging on me. A lot of events still have the dreaded unisex shirts (which, in my opinion, do not look good on anyone). Even when a women's cut is offered, though, it usually is still "boxy" and not as fitted as I would prefer. My solution? Modify and get crafty. If it's tech fabric, it usually will not fray if you cut it. 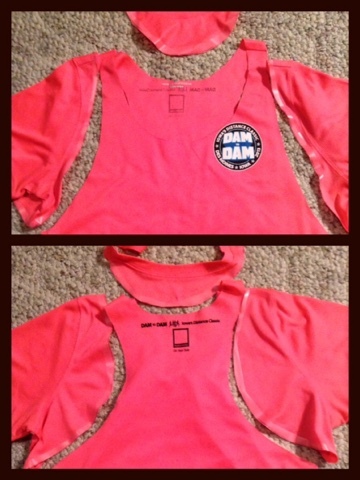 I have cut many of my event shirts into tank tops. At the very least, I usually cut out the neck and make it into a scoop neckline (which is much more flattering than a generic crew neck). Want some step-by-step instructions? Follow this LINK . From boxy t-shirt to scoop-neck tank with a racer back! Kinesiology Tape is your friend. Hate the look of an ugly PF sleeve? Tape your foot instead! 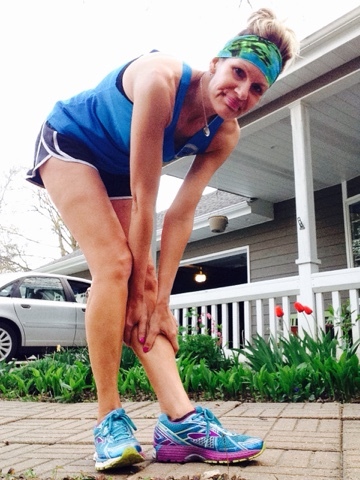 Last summer, I had my first-ever experience with Plantar's Fasciitis. YUCK! 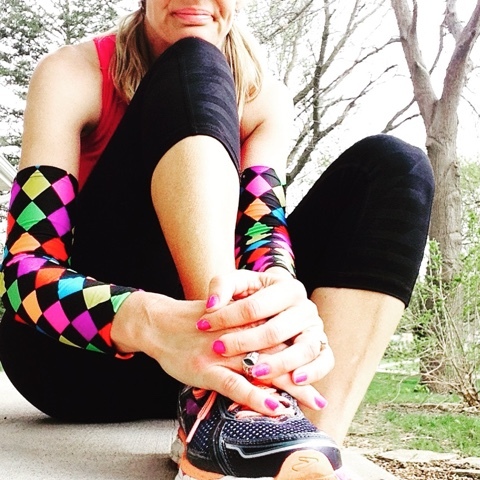 I bought a special compression sleeve, and it worked great...but it was SO ugly! 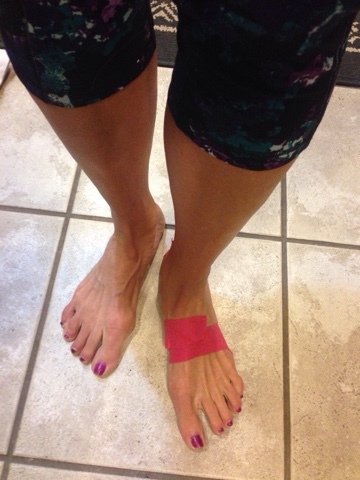 I discovered the magic of taping while at the Grandma's Marathon expo when one of the vendor workers taped my arch and heel. It felt just as good as the sleeve, but was much less conspicuous. Also, the tape stayed on for several days at a time (and didn't need constant laundering). This might not work for every person (or every injury), but I was relieved to have another way of dealing with that bothersome injury. Compression Sleeves. Do you have a favorite pair of capri's that you hate to put in storage in the winter? You could do what I do: wear them with compression sleeves on the bottom. They don't necessarily need to match, but it's not too hard to find sleeves that will (at the least) coordinate. 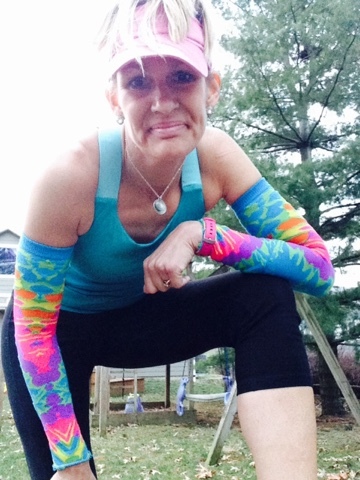 Also, I have worn compression sleeves under full tights for really long runs on really cold days. 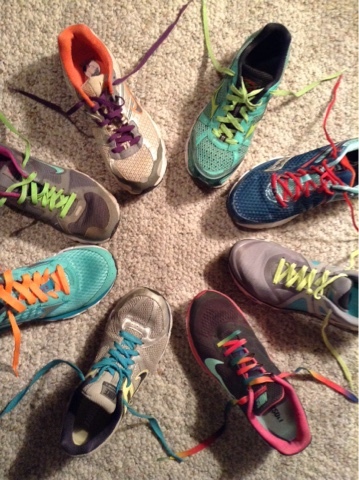 Shoes.... Not happy with the color selection of your go-to running shoe? Fix it, swap out the laces, or Sharpie-up the soles. It's really that simple. I even wrote a blog post about my obsession with colorful shoes (here's the LINK ). How about you? 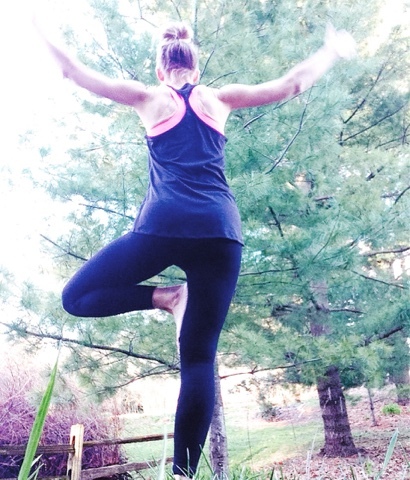 Do you have any fitness fashion hacks that have worked for you? An important thing I have learned in my (almost) 11 years of lacing up is to enjoy the journey (and not just in your running shoes). 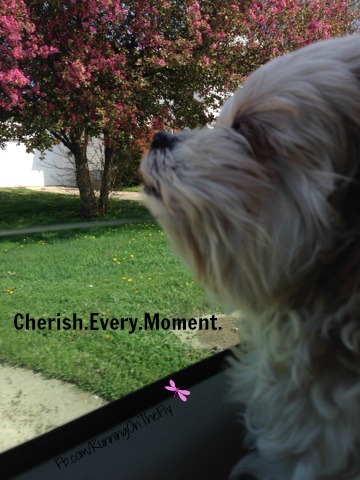 This week's theme: Cherish Every Moment. This week had so many incredible moments, starting with the Boston Marathon. Although I was not a runner in Boston, I know several runners who were there. This race is just such an amazing event....I (like many runners) get just as excited watching it as the actual runners who are running it. I worked in the morning, but watched some of the highlights after I got home. 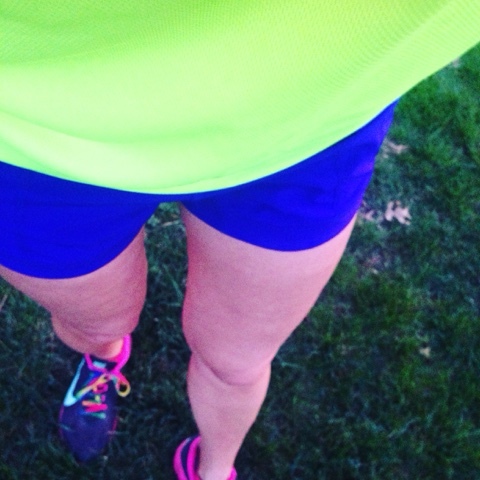 I did my "nevermissaMonday" run bright and early, in Boston colors. 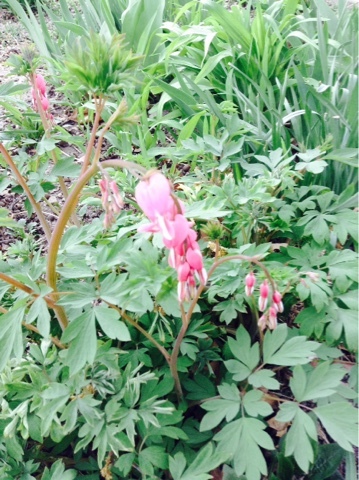 Tuesday, was a day with beautiful, spring weather. 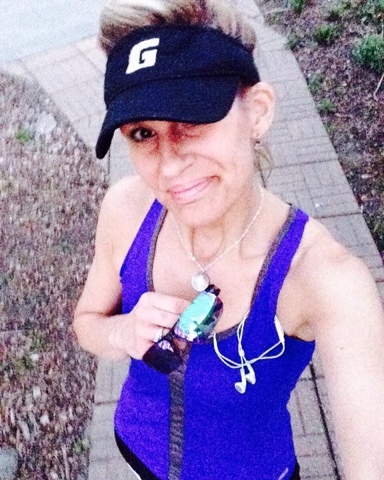 I worked all day, but headed out after work and ran four effortless miles at a progressive pace. Ahhhh...that stretch hurts so good! Wednesday...prom work (see below). This was my seventh year being in charge of the Presentation festivities. 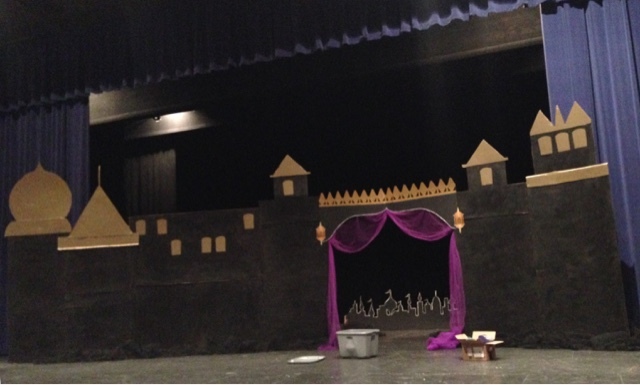 I have a committee (that has changed as the members have had students graduate), and I design and build (with the assistance of the husband and fellow committee peeps) the stage set as well as overseeing all the "behind the scenes" details. 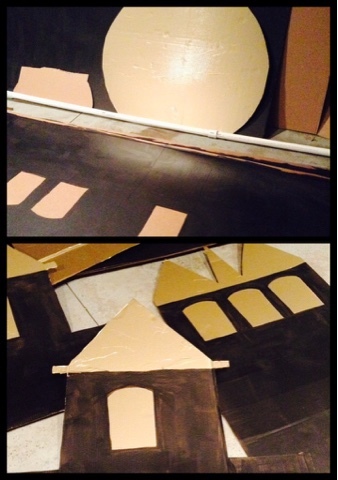 As usual, we're not able to get into the auditorium to build/construct the set until Friday evening, so my garage becomes a makeshift workshop/studio and I spend most evenings (in that final week) stooped over my garage floor...painting, cutting, lifting, and moving large (flimsy) cardboard pieces. It makes for a crazy week! Thursday was another long day at the office. 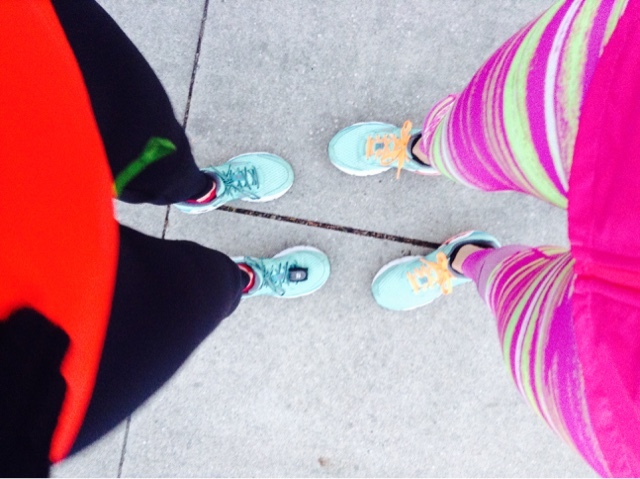 I met up with Barb (my main partner-in-crime) and we ran a solid six miles at a near-tempo pace. 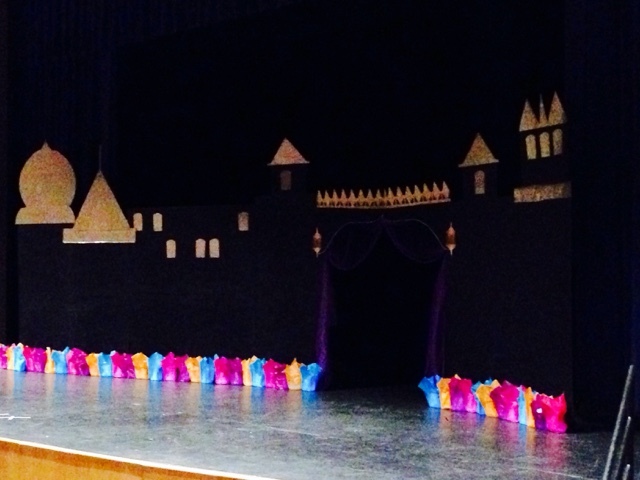 Friday...more prom work, this time actually at the high school in the auditorium. 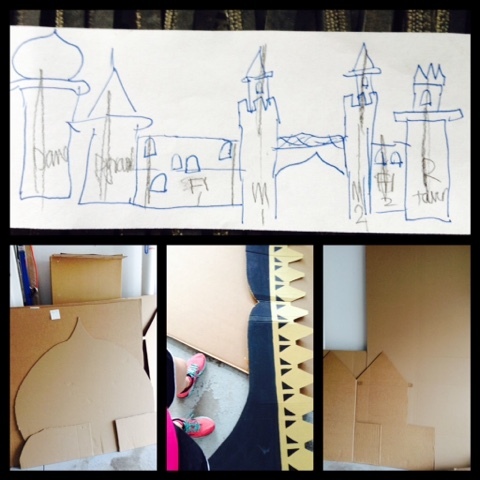 After loading and hauling all the cardboard pieces to the school, we begin the set-building. Most of these individual pieces are 8-ft. tall (not including the golden toppers), and need support-brackets to keep them in position. Thankfully, my husband is pretty handy with power tools. He's been doing this construction gig with me from the beginning, so he knows what I expect of him and he does a great job of bringing my "visualization" to life. Everything is up and stabilized! Saturday morning the temps were somewhat cool (high 50's) but very sunny and the wind was minimal. We have a half marathon coming up next weekend that will give us plenty of hills so we decided to tackle some hills in town. My husband even joined us for the first 4.5 miles. I have been drinking Beet Boost prior to my longer runs, and BAM! My energy is off the charts, and the running feels (dare I say?) effortless. Even with the numerous hills, I never felt like I needed to slow down. I didn't have my GPS watch with me, but Barb said we ran the second half of the eight miles with a negative split. I would even venture a guess that we ran those final miles with progressively faster splits as well. Saturday was prom night! Although we had no one from our household attending, the husband and I were there. Thankfully, the Presentation of Couples went well, and we had the complete set taken down and dismantled within 45 minutes. Our night didn't end there, though. The husband and I also volunteered at the after-prom party. Our shifts ended around 2:30AM, and we were home (and sound asleep) a very short while later. Sunday was a day of active recovery. I did have some residual stiffness, probably from the hilly run the day prior (and also from the late night working at Prom). I allowed myself a "no-alarm" slumber, and woke up around 8:00AM. I went for a long (and somewhat hilly) power walk with my sister, for six miles of cardio. Also, I spent several hours working in the raised "garden" by our garage. This little garden has become such an eyesore. 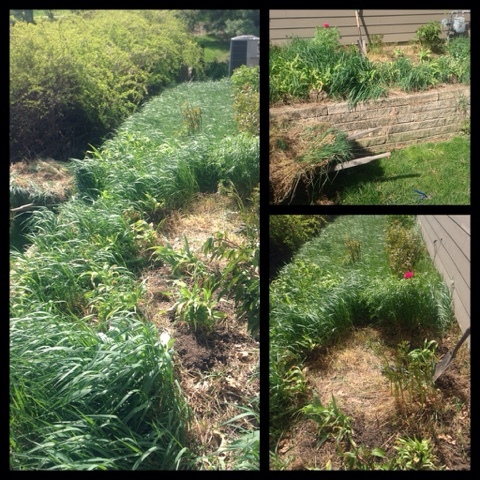 It is completely overgrown with all of this wayward grass that I have no idea where to begin on getting it back under control. 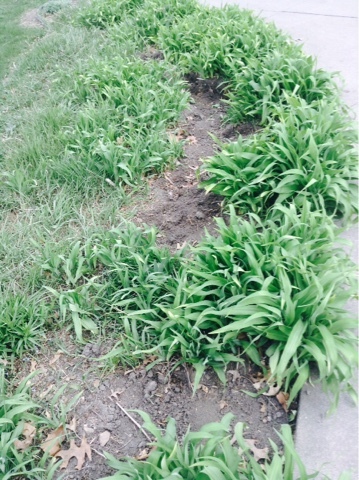 I also have several clumps of daylilies awaiting to be transplanted (from a recent dig-up/transplant job from another of my garden plots). When all was finished (for the day), I had almost half of the plot cleaned up. And, my glutes, hamstrings, and back got a good work-over as well. Total mileage for the week was 19 miles of running, most of which was at a fairly fast pace. My energy level has been in tip-top condition, and all of this week's training runs went well. My body has been pretty sore, though. 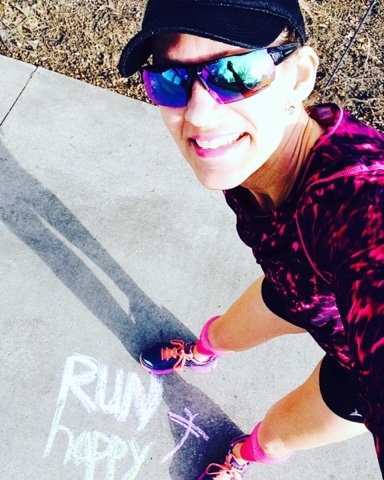 Last weekend, I ran my first-ever 10-miler in several months, and it was in the wind. With all the prom set construction this week, I have been in a constant state of squatting, so my hamstrings and quads have been on fire. This next week looks to be another busy one.... tennis meets, last-minute rehearsals for the youngest daughter's dance recital (which is Friday night), a party honoring all the graduating seniors at the other daughter's sorority on Saturday evening, and a half marathon on Sunday morning. Yes, the timing of my "taper" could not have happened during a more perfect week. 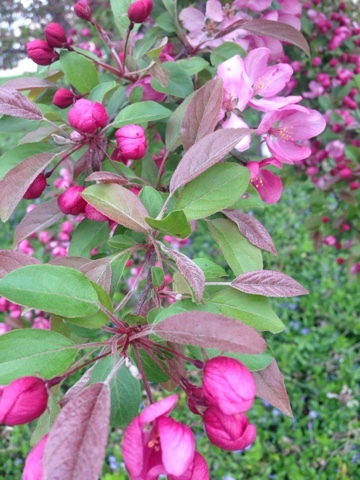 I am really enjoying all the beauty of spring! I wish all of these budding trees could stay like this forever! 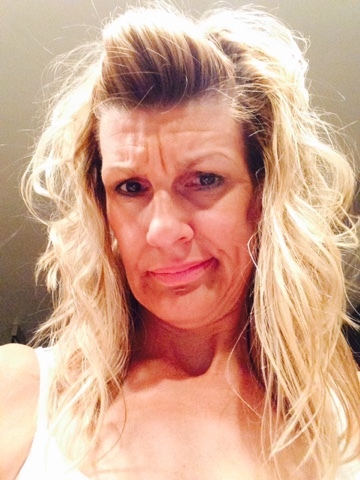 I've been continuing to have fun experimenting with different ways to wear my hair. It boggles my mind, however, that my hair actually looks longer when I do the beachy-wave look than when I keep it straight. Our little guy, Max, has really been loving the warm weather! He loves going for car rides (with the windows down). So, enough about me. How was your week? Any races on the agenda? Ever done a bunch of gardening and felt like you'd spent an afternoon power-lifting instead? 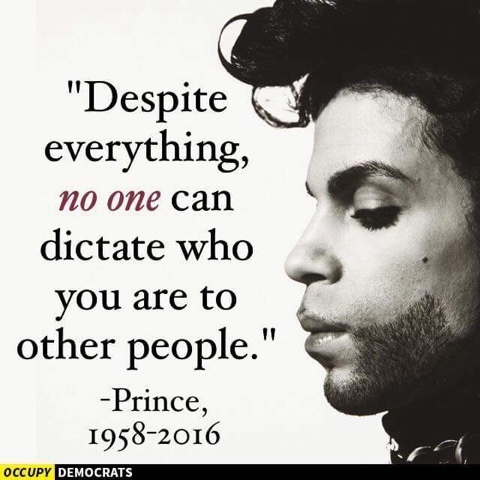 Were you a Prince fan? As usual, I'm linking up with Holly from HoHo Runs and Tricia from MissSippiPiddlin for the Weekly Wrap. Do head over and checkout their awesome blogs, as well as all the other blogs linked. Goals for 2016....how am I doing thus far? So far, so good. Of course, there's occasional stiffness (like at 5:31AM when I'm rolling out of bed and trying to not trip over the dog), but the "typical" achy hamstrings have been behaving. The piriformis? Still there, but also much more manageable. I seriously believe it was that off-season that did it for me. As much as I wanted to maintain the weekly long runs each weekend, my gut was telling me otherwise. And, this time I finally listened and obeyed. I have been slowly adding a mile each week to my "long" weekend runs, and that's been a smooth transition as well. I was even able to run my longest run of 2016 recently without much fueling, so that says something. This is an ongoing battle (much like a chemical addiction), and I have to really use restraint in hitting "submit registration." Some people like to have one big goal race to focus on. I like having big goal races, too, but I don't have a competitive nature. Sure, I like to better my finish times, but I just don't have the drive to train without distractions. Currently, I have some half marathons coming up, and I have an Ultra in mid-July. A 12-hour Ultra, none the less. Am I gonna train to maintain a 9-minute pace for 12 continuous hours? Hardly. Instead, I'm going to train to stay in (somewhat) constant motion for 12 hours, even if that means a snail's pace of intermittent walking breaks. And, I plan to utilize these half marathons as training runs. I'd like to (possibly) attempt to PR (in some of them), but it won't be an all-out-knock-15-minutes-off-my best-finish-time attempt. I have nothing to gain by trying to outrun each of my races. Eh, I'm probably at a B- (if I was to objectively grade myself). Granted, I do various forms of cross-training each week, but I should be doing longer sessions. For example,instead of 15 quick minutes of arm weights before bed, a 30-minute session would give me better results. I should dust off the kettle bell and play with it once a week (or bi-weekly). My abs have gotten more firm, but there still is no evidence of a six-pack. Really, I am alright with the absence of six-pack, but a little more definition would be preferred. Still a work-in-progress. I'm dong much better with dynamic warm-ups prior to running, and I'm stretching some of the time after each run....but I definitely need to do even more. And yoga? As much as I enjoy the benefits of it, I have slacked off recently and not made the time to do it as much as I should. This is in reference to speed (it would be nice to be just a tad bit faster), location (I would love to be in a more urban setting, with an endless selection of fascinating architecture, local races, and numerous trails at my disposal), and destination races (ahh, a generous budget to finance everything...but for now, family comes first, and our three kids' college educations take precedence). Envy is a double-edged sword, isn't it? It's easy to admire what others have and work to also acquire it.....but in dong so, we often overlook what is right in front of us. So far, so good on this as well. Definitely an A+ for this goal. 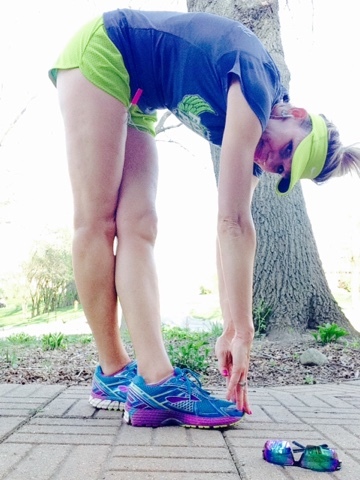 The majority of my Monday runs are recovery runs, and are simply an easy mile in my running shoes. Occasionally, I'll test the waters and go a little further. Personally, I enjoy having a scheduled run with no agenda in mind...no desired pace to hit (or maintain), and no do-or-die distance. So, did you set any goals for 2016? Have you stuck with them, or stayed on track? It's not too late! 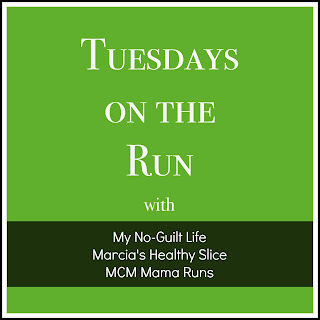 I'm linking up Marcia from Marcia's Health Slice , Erika from MCM Mama Runs , and Patty from My No-Guilt Life for Tuesdays on the Run. As you may have guessed, this week's theme is Goals. Head over and see what everyone else is chatting about! Not sure what's been up with the weather this past week, but Momma N gave us (almost) continuous sunshine! She also sprinkled in some wind (surprise #not), but it was manageable. Overall, I'm giving this week a '10,' in more ways than one. Monday had us sitting at a very windy TENnis meet for daughter #2. Thankfully, there was sunshine and we claimed a spot near a pine tree, so we were somewhat sheltered....but it was CRAZY. She won her match (doubles), and we sped outta there to get her back to town for dance practice. Once back in town, I met up with my running bud, Barb. 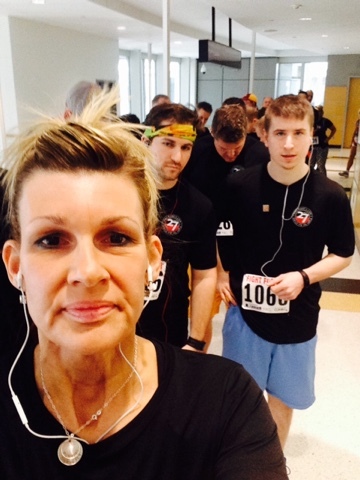 We had done a 5K on Saturday (and then did 6 bonus miles afterwards). 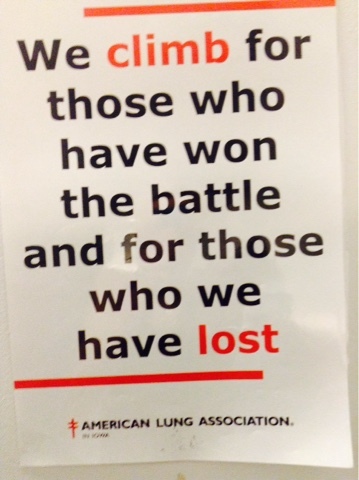 I also had done the Fight for Air Climb on Sunday, but needed to get my #nevermissaMonday thing done. 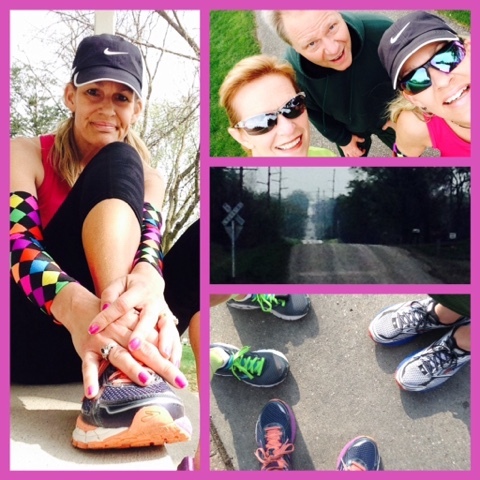 We set out to do an easy mile, but wound up doing three instead. Don't you just hate it when that happens? Not much to report from Tuesday, but I did some strength work on my arms and shoulders after coming home from another TENnis meet (with another doubles match win for the daughter). 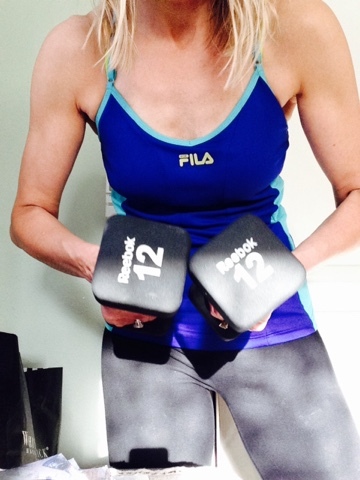 I'm a strong advocate for cross-training, and especially enjoy working with hand weights. I don't necessarily want a body-builder's body, but I do want definition! Strength is simply a bonus. Wednesday was another day with beautiful weather. The temps felt like we catapulted right into summer! 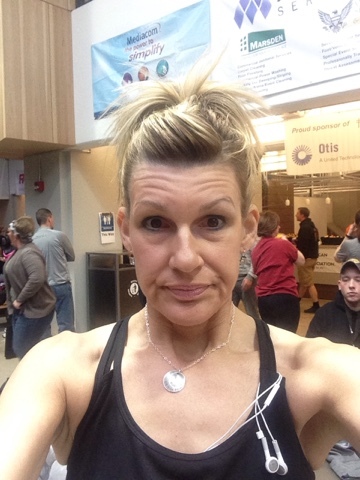 I did a quick 5K after work.....and how did it go? 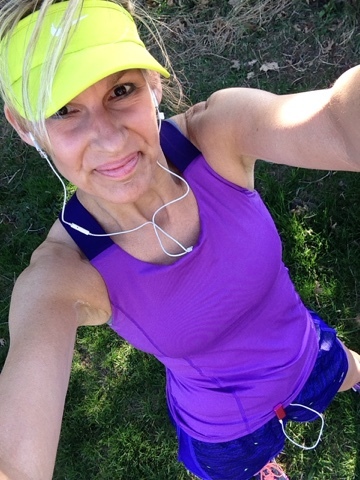 As I said on Instagram - Fairly Fast Feet, Several Sunshiny Smiles, and Tank Top Temps.....all made for a happy Kim! It felt SO good to be back in a tank top! We had another TENnis meet on Thursday (with another victory, for the daughter's doubles match and for the entire team!). Eager to capitalize on the awesome weather (again), Barb and I met up after I got home...and knocked out a little over five miles. Friday was a much needed rest/recovery day. It also was a carb-loading day in anticipation of my first double digit run of 2016 happening on Saturday. Saturday arrived with (again) oodles of sunshine and warm temps. Not only do I have an Ultra happening in July (12-hour endurance event), but there's also a half marathon happening on May 1st. I have been slowly building my long run distance (after a much needed off-season), and 10 miles was on tap for Saturday morning. Barb and I headed out around 8:00. Although there was ample sunshine and comfortable temps (low 60's when we started), we also had some wind out of the south. The wind wasn't a big deal in the first mile (as we were running east), or even during the second and third (as we turned and headed north). But shortly after the 3-mile mark, we turned around to head back into town....and let's just say the wind kind of laughed in our faces (literally). We had a straight, long stretch of almost four miles going due south, and the wind was intense! It was a warm "breeze," and actually felt refreshing, but it was a beast to battle through on our way to the next turn of our route. There is a down side to a tail wind (like we'd experienced prior to that dreaded turn-around). Yes, it can give you a substantial boost in mojo, but it may make you run a little faster than what you're aware. Holy reality check, Batman! Those four miles into that head wind were tough even though they were pretty flat! We could see most of the entire stretch of the road ahead of us. The turnoff was barely visible, way off beyond the horizon...and I was feeling pretty beat up for having run the first few miles so fast (my splits for the second and third miles were both under 9:00!). 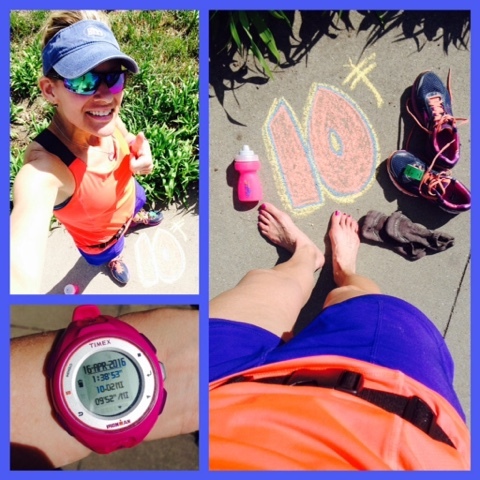 Although the final miles got a little challenging, those 10 miles actually weren't too difficult. Ironically, the final three miles actually were my slowest (10:19, 10:17, 10:19). Even with the wind (again) behind us, there were a couple small inclines and the temps had gotten warmer. I had my water bottle along with me (which I emptied) and also a Honey Stinger gel (which I never used). 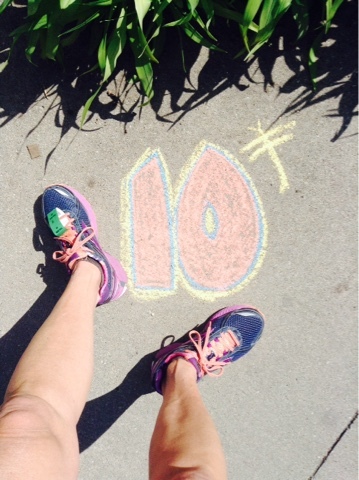 Even though I hadn't run 10 miles in several months, I wasn't worried about the distance. And, isn't that kind of crazy? I knew it would only be an approximate 90 (give or take) minutes, so I really didn't fuel like I should have. I had some oatmeal for breakfast, and a quick Beet Boost energy drink, but nothing else. I couldn't find my PlowOn gum, but I wasn't in a panic. I realize these long runs are more about distance and less about speed, so I just kind of went with it. Next time, I'll be a little more prepared and take the fueling more seriously. 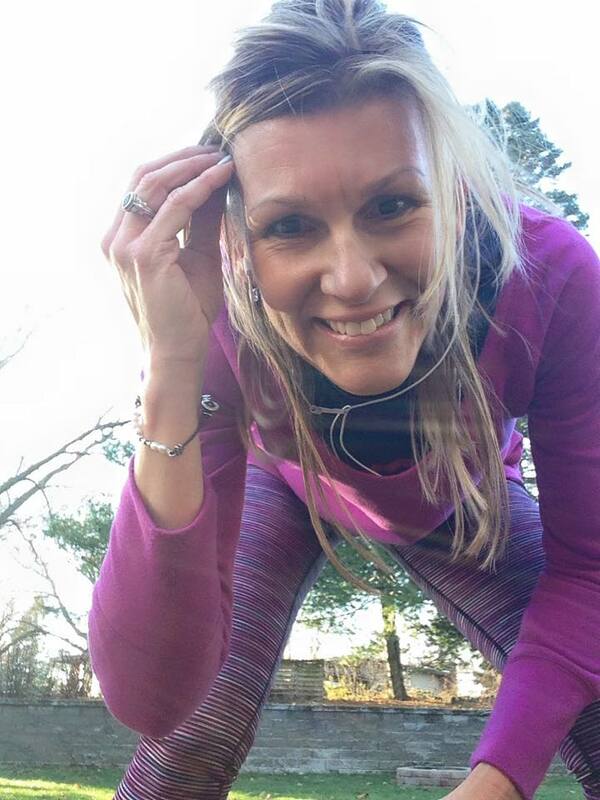 I'm thankful I can run 10 miles (after a lengthy off-season) without much issue, though. Had we waited any later in the morning before heading out, it may have been a different story. Sunday was very low-key. 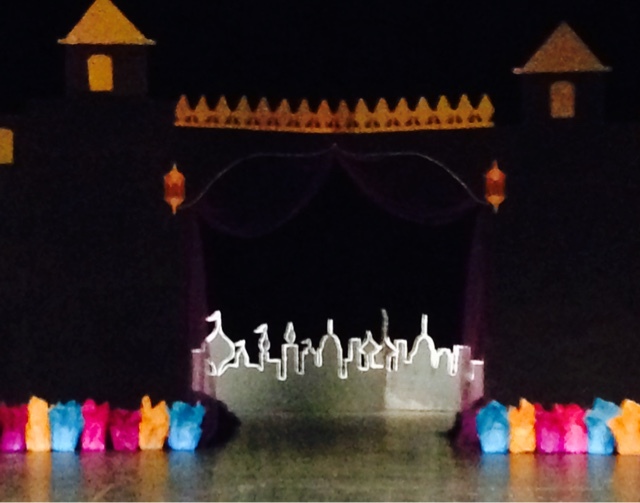 I went for a long walk in the morning and spent a good part of the afternoon working on decorations for the stage set of our high school's prom. This is my seventh year overseeing the Presentation of Couples, and I'm in charge of creating the "atmosphere" in the auditorium. I'm an art geek, so this has me totally in my element. Here's a sneak peak of what I started with Sunday.....stay tuned for a glimpse of the finished set next weekend. Also this weekend, I spent some more time digging and dividing and transplanting numerous daylilies. 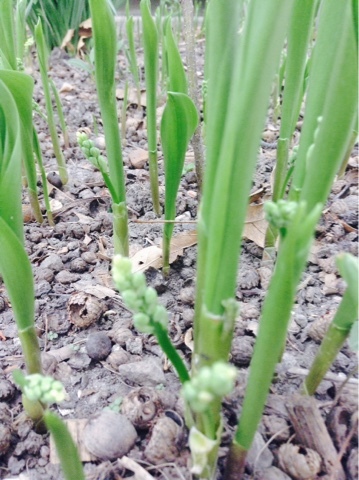 Every spring, I swear I'm going to get to them before they get too big, and every spring I never get it done on time. The weather usually keeps me inside (not the temps, but the rain). It's borderline late, but I got a lot of stuff moved around (and my back, quads, and buttocks are feeling the effects from all the "garden squats"). And, last of all, there's a little race happening in Boston on Monday. There are several peeps whom I'm stalking as they make their way from Hopkinton to the finish line. I'll be at work, so I won't be able to see much of the live coverage, but I'm just as excited as if I were there in person. 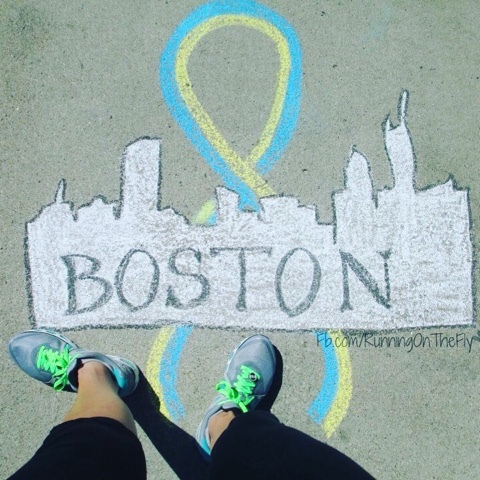 Are you watching the Boston Marathon? 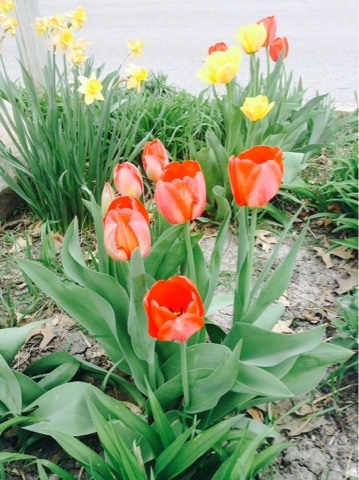 Spring bulbs in bloom in your yard? Have you ever taken for granted the necessary fueling for a long run...and actually did alright? 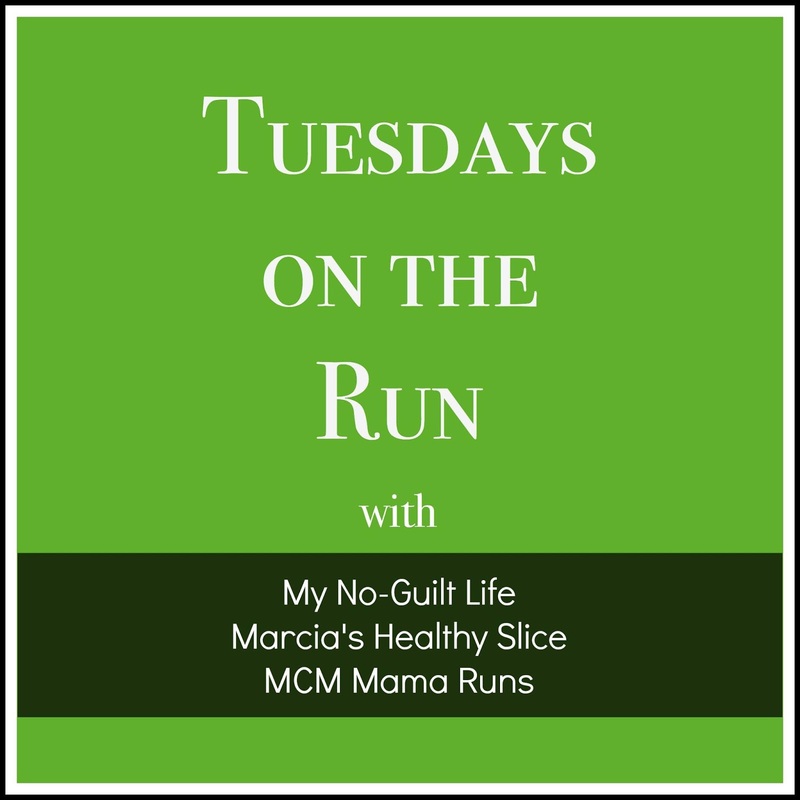 As usual, I'm linking up with Holly from HoHo Runs and Tricia from MissSippiPiddlin for the Weekly Wrap. This little linkup is now a major ordeal, head over and checkout all the great blogs and see what's happening! Upping my game.Taking it to the stairs. Powering UP. 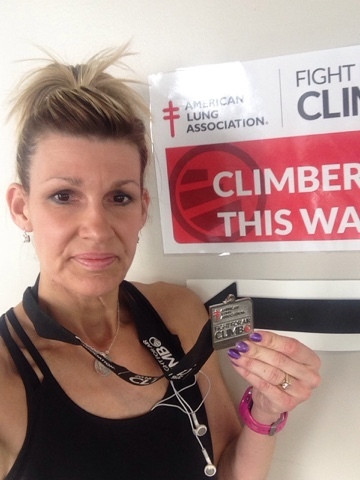 Call it what you will, Fight for Air Climb is a challenging event that I have eagerly registered for since my first Climb in 2013. 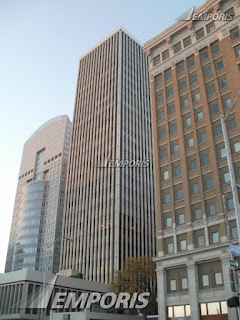 This was my fourth time taking part in the Des Moines venue (I also did the Chicago venue in 2014).The first two years, we climbed the same three buildings (the EMC Building, Hub Tower, and Downtown Marriott). Last year, a fourth building, the Ruan Center was added (bringing with it an additional 32 flights of stairs). 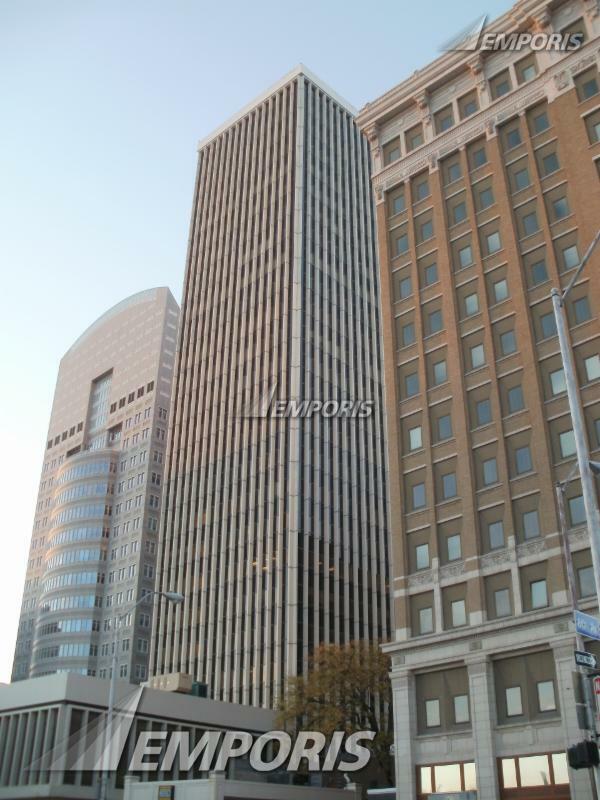 This year, The Marriott exited the event, and was replaced by the Financial Center...giving us a grand total of 86 flights of stairs to conquer. As a participant, everyone has a registration fee of $25 (or, if you register during the early-bird period, you can get in for $15!) as well as a mandatory fundraising obligation of $100. I have never had to pay the full $100 myself (I've had lots of generous friends and family members, as well as my employer, contribute to the cause), but I have donated towards the funds. 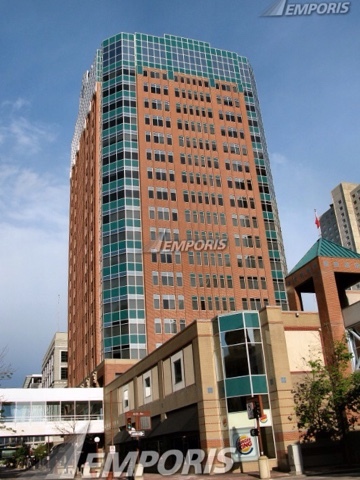 Also new this year, the event was hosted at the Des Moines Partnership Building. All of these buildings are located in close proximity to each other, and are connected by the elaborate skywalk system, so you never have to go outside (until it's time to find your car and head home). You check-in at the host site, and are assigned a wave (for your start time). When your wave is called, you line up and your wave "group" is then ushered to the first building. Each wave has about 20-30 participants, and each of the climbers are allowed to start in (approximate) 10-second increments. Consistent with my three previous climbs, I started off too fast. I do most of my climbing in two-step intervals, and I have so much energy at the start, it's really difficult to hold back. The stairways (in all four buildings) are split-stairs....each flight actually has two sets of stairs- instead of going straight up 10-12 continuous steps, you have maybe 8-9 steps in one direction, a small landing, then 8-9 steps in the opposite direction. It's basically a constant spiral adventure to the top of the buildings. I usually can make it about halfway to the top before I need to slow down. I continued taking the steps by two's, but did more of a "walk" instead of a "run." There's volunteers every third or fourth floor, with water and lots of encouragement. I made it to the top of the EMC in 3:25 (official split time). We are required to ride the elevators down after each building's climb, which is really a good thing. You can hang out in the hallway as long as you wish before going down. When you're back down on the skywalk level, volunteers are stationed to point you towards the next building. There are plenty of signs (with arrows) along the short walks between the buildings, as well as water stations. Leary about going out too fast (again), I tried to take the stairs a little bit slower (but I still started out too fast). I was wearing a tank top, but had also been given a team shirt (short-sleeved, tech fabric). And I was a hot, sweaty mess! My throat was extremely dry, and I could feel my heart beating like crazy. I made it about halfway and decided to take the steps by singles for a couple flights and give my self a chance to catch my breath. I didn't really slow down much, but the single-stepping was a nice (brief) break. Almost every landing between the stairs had motivational posters, which not only are a good distraction, but also a great reminder why this event exists. I finished the 22 floors of the Financial Center in 5:10 (official split time). And I stripped off the team shirt and rolled it up and used it to wipe my face. Frustrated with the fatigue from starting out too fast, I decided to try a different strategy in the third building - intervals. I'd try to take the stairs by-two's for 4-5 flights, then do a few flights of singles, then resume the double-stepping, etc. The first set of doubles went well (and I was careful to go easy and not "run" them), so I switched and did a few flights of singles. This worked well! I switched back to doubles (around the 7th floor or so).....and before I realized what was happening, I was almost to the top. And I had forgotten to switch back to singles. Oops. I had written my splits (from the previous year's Climb) on a paper, to give me something to gauge my climbing time. 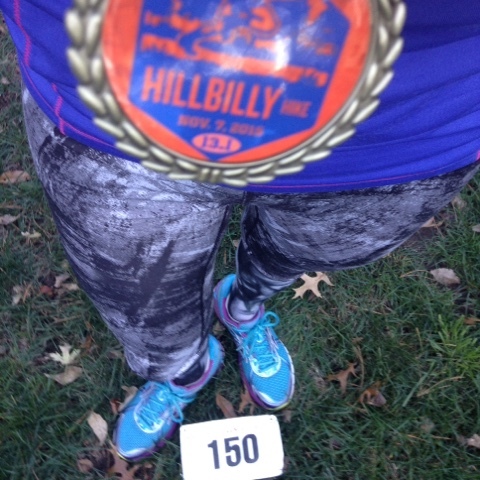 Secretly, I was not only hoping for a PR, but also to place in my age group. I had placed 5th in 2014, and 4th in 2015...so I was hoping to continue the momentum and snag a third place (or higher!) finish. 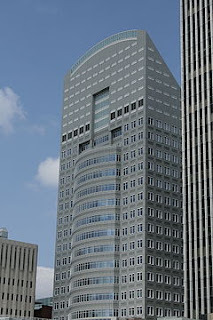 Since the Financial Center was a new building (with no previous "climb time") and the Ruan Center had been moved to the last building to climb (it had been building #3 in 2015), my previous splits were only a guide. The Hub Tower climb went well; I made it to the top in 3:28 (official split time). A welcome sight! Headed to the fourth building! Wouldn't you know it? They saved the tallest building for last! 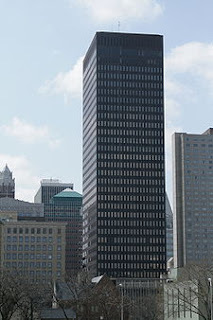 The Ruan Center was a "new" addition to the Fight for Air Climb in 2015, and I remembered it as being the toughest building of all of them. Knowing this, I knew I had to really pace myself well to climb 32 flights of stairs. Similar to the previous building, I decided to start out slow and easy, but still take the stairs by doubles. No racing. No running. Just slow and steady. I also paused a couple of times to get pictures of some of the posters. I did a couple flights here and there with single-steps, but I much prefer double-stepping. 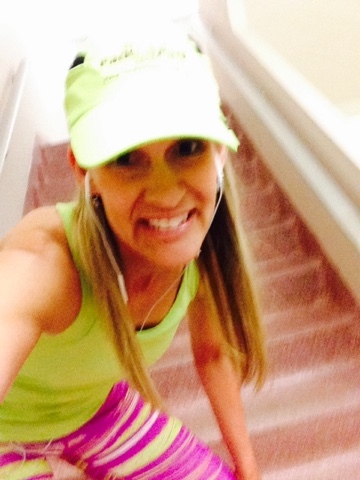 Stair-climbing is really a lot like running hills (steep hills!). When it comes to running hills, I have learned that I can sometimes "walk" a hill faster than I can "run" it. The same goes with stair-climbing....I'm stepping "slower" by taking the steps by-two's, but I'm covering twice as much distance (with less effort). I climbed most of the final building (by taking the steps by-two's), and passed the halfway point much faster than expected. It turns out, I climbed the Ruan Center almost an entire minute faster this year, finishing it in 6:50 (official split time). Usually, there's a timing station near the finish line, where you can get a printout of all your splits (each building is timed individually, with timing mats at the bottom and top of the stairways). Things were a little chaotic this year, probably a result of the different location for the host site. Not a big deal, but certainly frustrating. Anyways, My watch showed my finish time as being 19:13, which was a substantial PR from the 20:26 from last year. I should mention there were seven fewer flights of stairs this year...but with that change (the Financial Center joining and the Marriott leaving the lineup), the climb actually was more difficult. Even with fewer stairways to climb, all 86 flights were now "split-stairways." Losing the Marriott meant losing all of its single-stairways (which, by the way, are much easier and faster to climb than the split-stairways that require twice as much pausing/turning on the landings). In my opinion, losing seven total flights really did not give us any advantages over the last year's venue. Imagine my surprise to see my actual "official" finish time posted as 18:53! Granted, it was a great surprise, but I do question how accurate it is since my watch recorded a 20-second (slower) difference. I can understand my watch not being exact to the timing mat, but 20 seconds? At first, I was a little upset that it didn't reflect what I think my "authentic" finish time was....but I assume it would also be off in other participants' times as well. I have scoured the posted results (numerous times), and it appears I placed in the top five in my age group. I was hoping for a higher placing, but given the circumstances I'm just accepting it for what it is. I did have a faster time this year (even with a more challenging race), so I'm calling it good and letting it go. As mentioned, I climbed as part of a team. I was recruited by Team 27 for my second Climb (in 2014), and have been a part of the team since. It's actually one of the top fundraising teams in the country, and definitely the biggest team at the Des Moines venue. Other participants climb as individuals (which I did my first year). Walking to the first building..."Who is this chick taking a selfie with us?" An especially neat aspect is the challenge that exists amongst fire fighters! 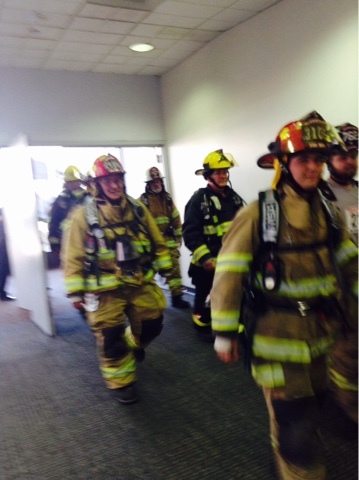 Every year, there are numerous teams of fire fighters from various towns...and all of them climb in full gear. They always get a standing ovation as they line up and make their way to the stairs. Despite the slight discrepancy (?) 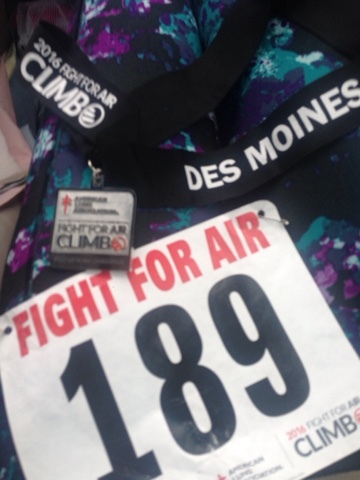 with my official results, and the chaotic atmosphere in this new setting, the Fight for Air Climb is definitely a favorite event. 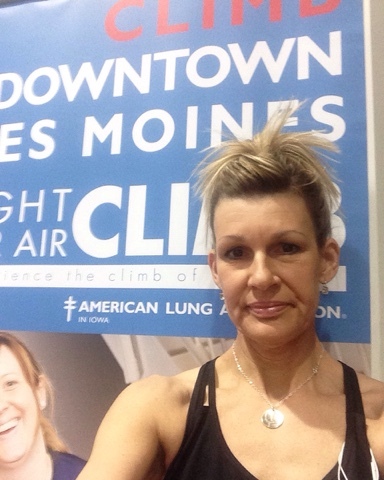 I'm a huge advocate for fresh air, healthy lungs, and strong bodies. 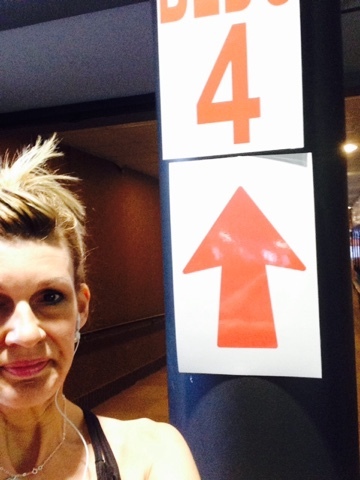 I also love the challenge of doing something (like racing up 86 flights of stairs!) that most people are afraid to attempt. Although my finish times have improved each year, the challenge never really gets easier. Why? As I improve with my stair-racing abilities, I also challenge myself each year to climb faster and do better. So, what do ya say? 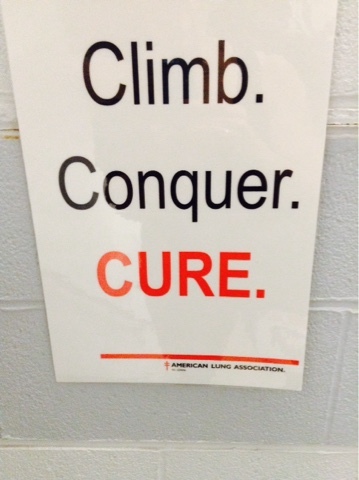 Are you ready to take on a Climb? 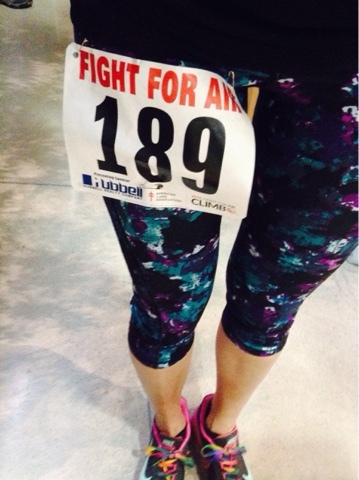 Have you ever participated in an event where you've had to fundraise for the cause? 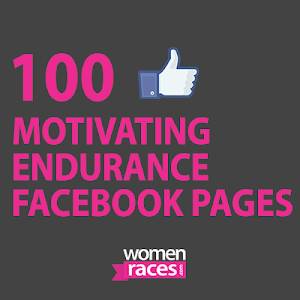 Ever felt your official results were "faster" than what you thought they should be?